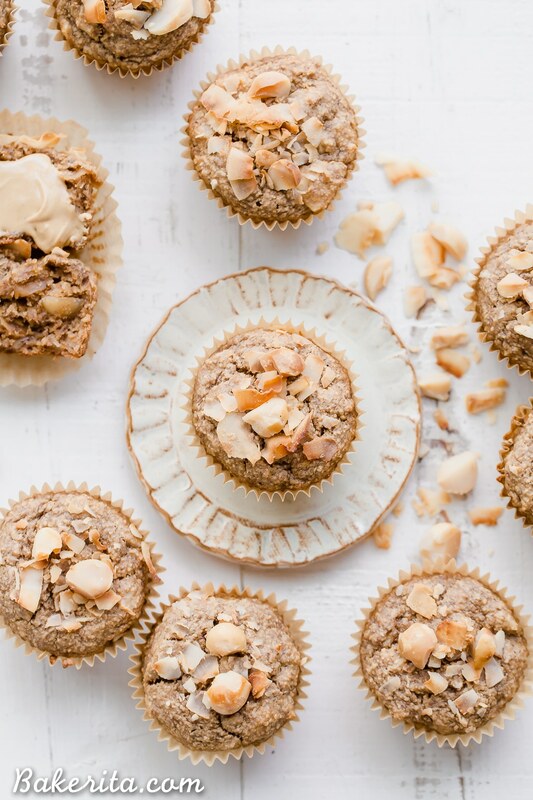 These Macadamia Nut Coconut Banana Muffins are tender, moist, and perfectly sweet for breakfast. 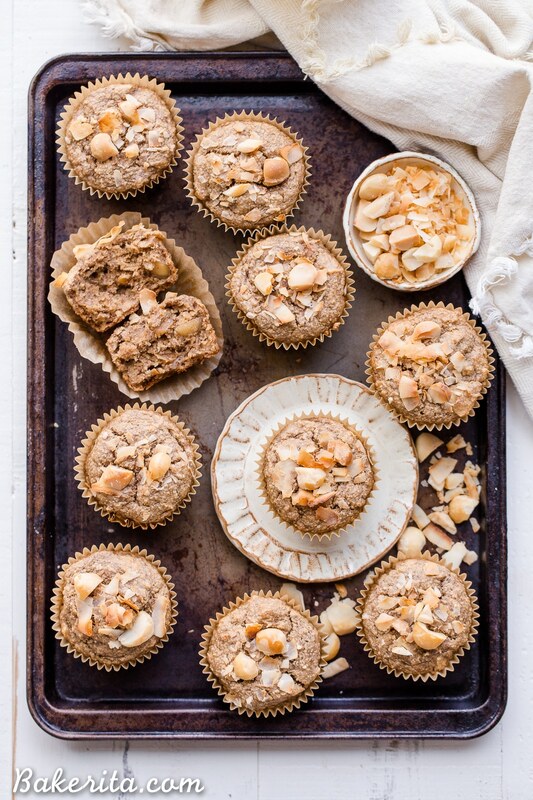 Slathered with a little jam or nut butter, these gluten-free and vegan banana muffins make a wonderful snack or breakfast that will keep you satiated for hours. It took me way too long to nail gluten-free AND vegan muffins, but finally, they’re here, and if I do say so myself – I nailed it. There have been a lot of trials and tribulations on this journey to gluten-free vegan muffins that were fluffy, moist, and delicious. Previous tests have ended up dense, gluey, and overall NOT what you want from a muffin. I don’t lower my baked good standards just because something is gluten-free, vegan, and refined sugar-free. I still want the same rise and crumb and delicious flavor that you’d get from a fully gluten- and dairy-filled muffin. So needless to say, it took (more than) a few attempts. But when I pulled these Macadamia Nut Coconut Banana Muffins out of the oven and saw how beautifully they had risen, I knew we had a winner. I was correct, especially after they kept that nicely domed top and didn’t fall down as previous versions had. I’m still working on nailing the paleo and vegan version, but that’s another topic for another day. 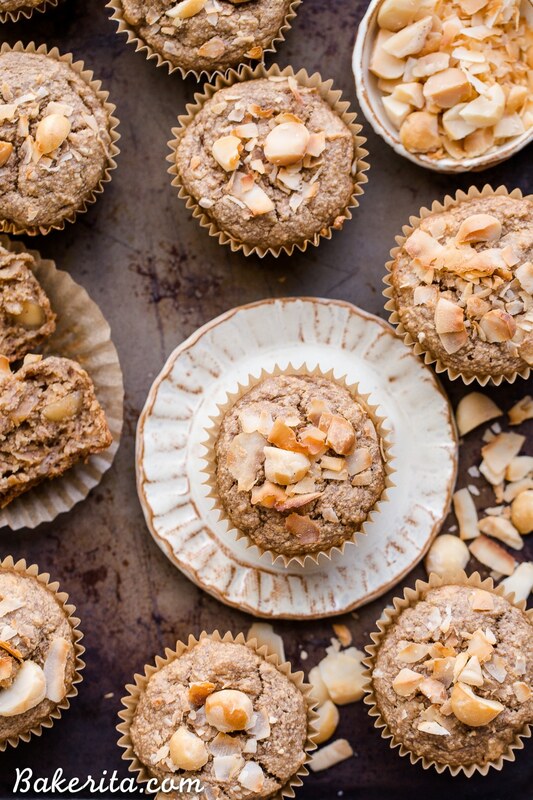 Let’s talk about what makes these muffins so deliciously awesome. Like I just mentioned, these aren’t paleo. The reason for that is oat flour – I find oat flour replicates all-purpose flour closely enough that it provides enough structure without eggs or dairy. Oat flour can be super absorbent and can get pretty dense if it’s the only flour used, though, so I mixed it with almond flour for these muffins. Together, they work perfectly. There’s some nut butter in the recipe too, which I find helps keep things nice and tender while also providing a little bit of structure. Of course, loads of banana in there ALSO help keep things moist and super tender, while also providing a ton of delicious fruity flavor. 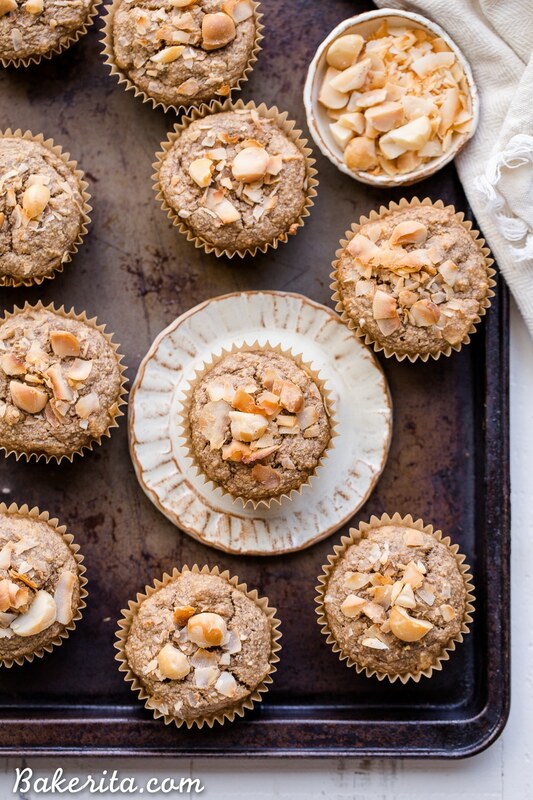 Cinnamon, toasted coconut, and toasted macadamia nuts add warmth, texture, and so much delicious flavor to the muffins. The way it all comes together is so heavenly, you’ll be hard-pressed not to devour one warm, straight out of the oven (in fact, I’d recommend that you do). 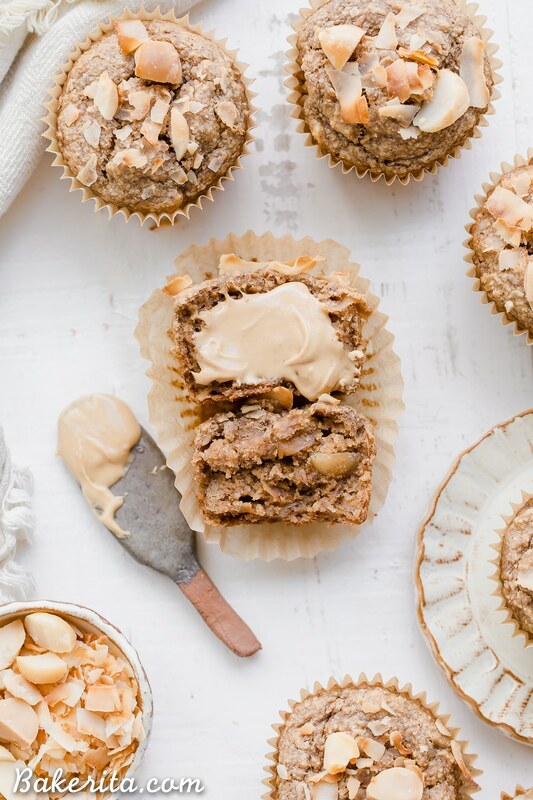 My favorite way to enjoy them was slathered with a little nut butter (cashew butter is insanely good on these), but even plain, they’re awesome. Also if you can resist eating them all while they’re fresh, you can keep them in the freezer and heat them up in the microwave for a bit for an insta-breakfast. Preheat oven to 350°F. Line a muffin pan with liners or grease with coconut oil. Place bananas in a large mixing bowl. Use a potato masher or fork to mash them well. Add almond milk, coconut sugar, nut butter, coconut oil, and flax meal, stirring to combine. Add oat flour, almond flour, baking soda, baking powder, salt, and cinnamon. Stir until combined. Fold in the coconut and macadamia nuts. Divide between the 12 muffin tins. Bake for 20-22 minutes, or until a toothpick comes out clean. Once done, let cool completely on a wire rack. Store leftovers in an airtight container on the counter for up to three days, or store in the refrigerator for up to a week, or in the freezer for up to 6 months. I like to freeze and heat a muffin in the microwave when I want it! Hey Rachel, just wanted to ask if I could use an alternative to oat flour as I’m oat and wheat intolerant?? 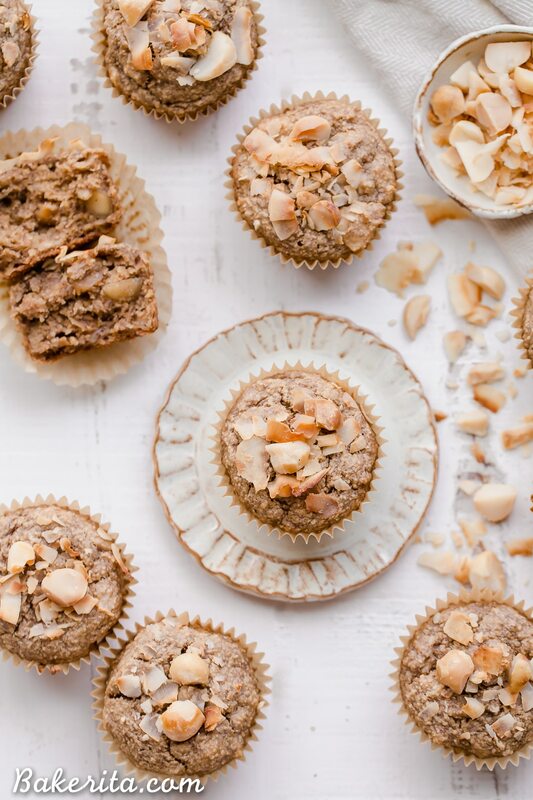 Hi Helen, oat flour is pretty crucial to the texture with these and they didn’t turn out quite right for me with a different flour – you could try an AP GF baking flour, or using a recipe like my paleo banana nut muffins and add in toasted coconut and macadamia nuts instead of the walnuts. Hope this helps! Is there something I can use instead of coconut. My son does not like coconut flavor. Thanks for your great recipes. The almond butter chocolate chip are a hit at my house. Hi Alba, I’d just leave out the coconut if he doesn’t like flaked coconut! You can leave it out entirely or replace with a similar amount of another mix in, like chocolate chips. What’s flax meal? Can I sub for egg? Flax meal is ground flax seed. Haven’t tried it that way so I can’t make any guarantees!